I’d likeÂ to take the time to clarifyÂ right here that I’ve been home for about a week and a half.Â My head might still be in the clouds about my vacation, but physically I am back in Los Angeles.Â I alsoÂ didn’t bring anybody back a bierstein because those things areÂ really heavy. I only brought myself one for my desk at work. That way, I can taste theÂ Bavarian beer on my lipsÂ everytime I look at it. Ah. The beer of which only 4 ingredients is made. It doesn’t usually make a difference what day it is when you’re on vacation (what does matter is when it’s rush hour), but it was Saturday when we visited Positano. 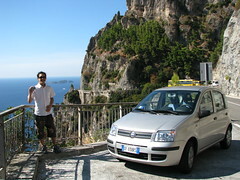 Positano is positioned along The Amalfi Coast on the way of our drive from Sorrento to Ravello. It was where most attendees of the wedding were making their day trip before the wedding celebration on Sunday. 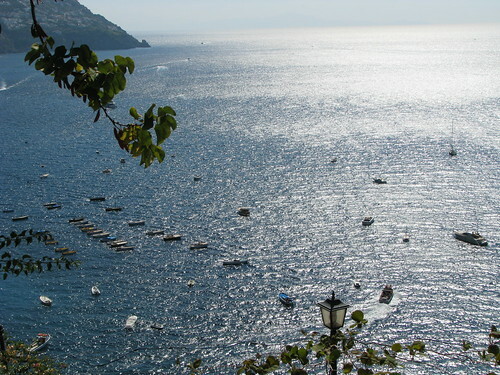 It would be an absolute beautiful day on The Amalfi. Since by Friday most of them had already checked into their hotels in Ravello, the site of the wedding, we sucked up some international roaming minutes and coordinated the meet halfway in Positano. We heard it was a beautiful town, so what better way to see it? 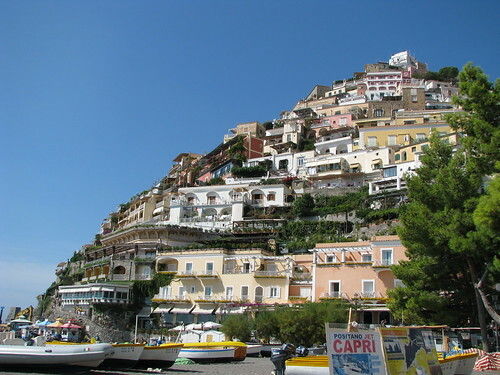 And it was Positano that was on the cover of our trusty Frommer’s The Amalfi Coast travel guide book. 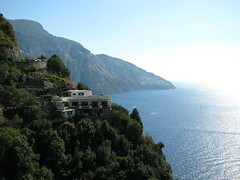 Houses on a cliff reaching toward the sky. Grey, pebbly beach below. The clearest water I’ve ever seen stretching across the sea. In fact, it was this water through which I could count each individual grey pebble–at least to the depth of two feet.We met up with the suspects at large and had a snack or two. Ice cream (for Lisa, of course), pizza, bruschetta, panini … We had learned to say Il canto per fervore (that is, the check, please) by that time because when you travel,Â forget evenÂ “excuse me,” youÂ are going to ask for the check far more often. Unless you are more polite than I am, which wouldn’t be saying much. I don’t know if there is a more beautiful place on Earth than Positano, but I have certainly never met up with friends at a place more beautiful than this. The specialty item you find in Positano, and most any town on The Coast, was Limoncello. It’s a sweet liqueur, if a bit pungent–obviously flavored with lemon. The region is lined with lemon groves and that is their thing. You could also find linens and other random unfashionable garb to buy, but I figured that if I was going to buy things in Italy for myself or as souvenirs for other people I might stick to the fashionable finds. I did find a pair of shoes in Sorrento that was of a sub-brand of Miss Sixty called, “Killah.” We saw a lot of Diesel, G-brand and Miss Sixty, actually, throughout the trip. My guess is that they all originate from Italy.In Positano was where we’d spend our only day of the trip lying on the beach. A few of us stayed on the paeon side where it was free to loiter there while some others paid 10 Euros to use the city’s fancy chairs complete with sun shields. I think they were given a towel to use, too. Joe, the groom and a half-Ironman, made laps in the extremely salty water for a workout while Sandy the bride made laps on land. There was barely any sand. Whatever sand there was, it was grey, and closer to the beachfront it was huge rocks and pebbles. Not exactly recommended for beach running. But the water was so blue, so clear–and so salty. While going into the water to cool off, some of it touched my mouth and it was almost unbearable. At one point I stood in the water atop the hurtful pebbles and rocks below to find the rest of my bodyÂ buoyant. I looked down and could see my toes in the water, my feet barely treading. This was certainly a special place. P.S. – I forgive the vocal American youngsters seemingly on MTV Spring Break Without MTV behind me who were thrilled at the aspect of being in possession of alcohol in Italy while playing albums of Jack Johnson straight through, or on repeat, I’m not sure which. ← No Way, You’re Kidding!